Today the economic performance of American cities is more uneven than ever before. Some cities are growing fast, attracting innovative employers and adding well-paying jobs. Other cities are falling behind, shedding jobs and losing population. As the economic fortunes of American communities keep growing apart, the financial return for geographic mobility keeps increasing, but only some Americans exploit this opportunity. Then came the New York Times article yesterday on the importance of attracting and retaining college educated individuals for cities. This article goes on to reference Professor Moretti in addition to a new Brookings Institute study, Harvard Professor Edward Glaeser, author of Triumph of the City, and Joe Cortright who has conducted extensive research on education attainment, economic development, income and the like and also just so happens to be the chair of the Governor’s Council of Economic Advisors.The NYT article uses Dayton, Ohio as a case study and how many younger, educated workers are/have left the area. Rather than quote extensively from the two articles, you should really read them for yourselves. All of this leads me to the following. After the WSJ article I went and downloaded Census Bureau data on the 50 largest MSAs in the country. Technically, the following graphs are based on the 2010 American Community Survey 5 Year data. 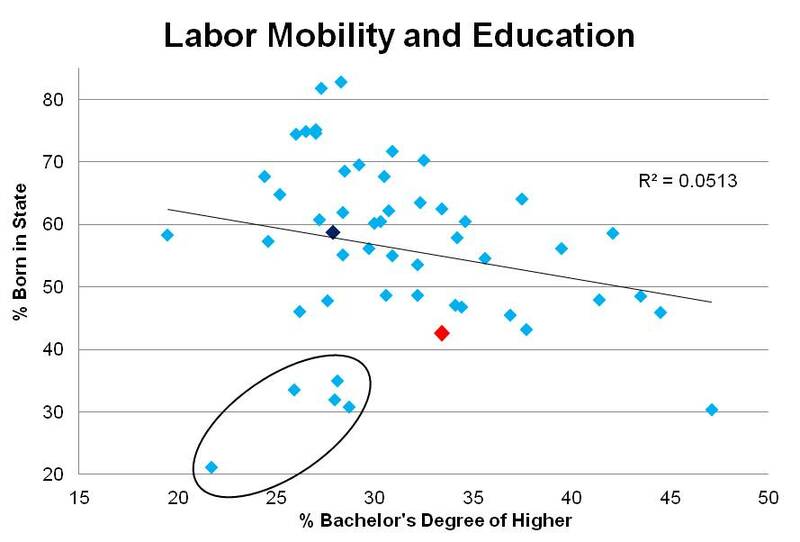 I wanted to see the relationship discussed in the article, namely labor mobility and education attainment. Getting really good data on labor mobility at the local, detailed level is difficult but using the percentage of a population that was born within the same state is a pretty good measure and one consistently available from the Census data. A simple scatter plot reveals the following. Note that Portland MSA is the red point and the U.S. total is the dark blue point. Overall there really isn’t that much of a clear pattern among all 50 cities, however there is a cluster of outliers down in the lower left region of the graph which really do affect the regression line. It turns out that these cities are Las Vegas, Miami, Orlando, Phoenix and Tampa. Hmm. Given the time period of the data (2006-2010) and the fact that these cities are epicenters of the housing bubble and strong retirement destinations, one may be willing to discard the data points. Typically I am not in favor of removing data points but for a 10,000 foot view like this, I’ll make an exception. Obviously the relationship is much stronger, but again, not overwhelmingly so. I think some of this has to do with what the measures are capturing. Obviously this quick look does not try and account for any regional economic effects – Prof. Glaeser notes in the NYT article that cities with the most educated populations had an unemployment rate of around 7.5 percent while cities with the least educated populations were more like 10.5 percent – or industry structures, both of which are important to employment and income growth. 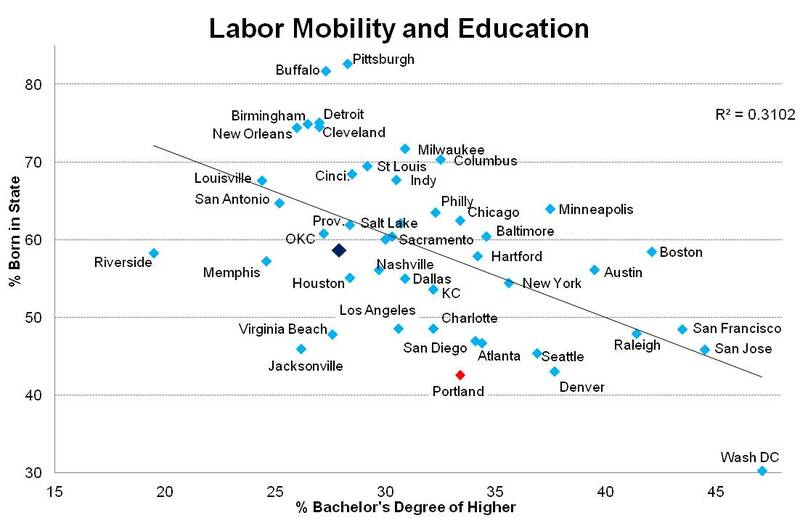 Also the labor mobility measure is not perfect as it would not capture an individual born in, say, Pendleton and moved to Portland after college since both cities are in the same state. In terms of Portland, the city has the 15th highest education attainment out of the top 50 cities at 33.4 percent of the 25 years and older population having at least a Bachelor’s degree. Portland’s education attainment is significantly above the national average however it is only slightly above the average of the 50 largest MSAs (31.3 percent). Portland is more of an outlier in terms of the native (Oregon) born population, where it ranks 44th highest, or 7th lowest. The cities ranked lower than Portland include the 5 outliers (Las Vegas, Miami, etc) and Washington D.C. In essence, after excluding the retirement/housing bubble cities, Portland only trails the nation’s capitol in terms attracting in-migrants, many of which are college educated. This particular trend, as you well know, is the one that stands out and is frequently discussed in reports and the media. Overall, the takeaway from the research (the aforementioned articles and also the skill polarization of jobs, of which I hope to have more in the coming week or so) is that cities that have been and are able to attract an educated workforce are doing comparably better than those that are not. This is not a new trend or development in the economy, however so far into the recovery this trend is being reinforced or even amplified. Oregon is no exception and has certainly seen the divergence in employment growth between the rural and urban portions of our state. Misc Notes: Removing Riverside, CA strengthens the relationship further (R-squared of 0.35) but the story remains the same. There is a clear geographical pattern to the scatter plot between the Rust Belt cities and the Sun Belt (and Western) cities. All calculations are based on the 2010 ACS 5 Year data; using different years alters the specifics of the calculations however the overarching story remains the same.